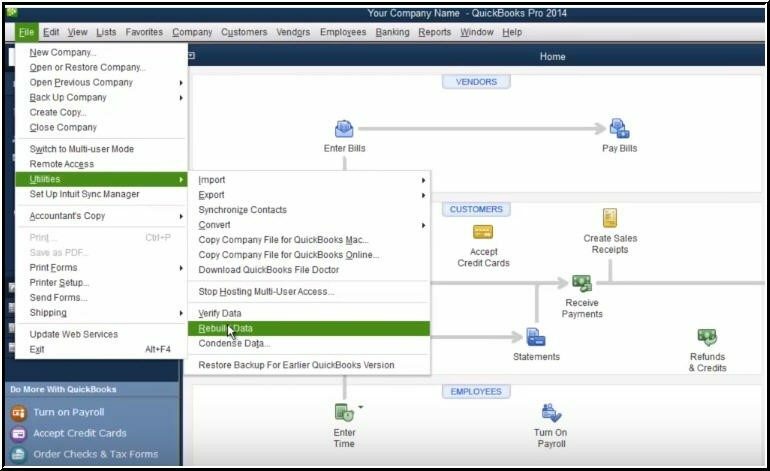 This post summarizes information about QuickBooks business accounting software and explains why accounting data is important for organizations. Manual ways to repair QuickBooks files using built-in functions such as Verify Data and Rebuild Data are mentioned along with the professional utility to repair QuickBooks when the intensity of corruption is higher. Keeping track of accounting information and figures is important to any organization as it is required for record keeping, decision making, as well as prevention and discovery of thefts. For organizations, it is vital to keep track of the flow of money that comes in and the money that goes out. The financial figures and reports are typically monitored by accounting department through analyzing transactions and dealing with taxes and payrolls. QuickBooks is an accounting software for small, mid, and large sized business firms for managing payrolls, sales, inventory, and a variety of finance related operations. It makes accounting operations easier and automate transactions. The major function of the software is to simplify the use of spreadsheets, multiple tables, tracking sheets, and other components that make up accounting processes of the organization. With QuickBooks software application, all finance-focused operations of the business seem easier, until you encounter corruption in QBW files. Undoubtedly, QuickBooks QBW files are prone to getting corrupt and can become unreadable easily due to which the business operations may get affected. QBW files is a big database file that incorporates information about Company, Customers, Vendors, Employees, etc. and it is important to resolve QuickBooks file corruption with utmost consideration. If any of the QuickBooks files gets corrupt, the business activities get affected considerably! QBW files not only helps track financial records of any business organization, but also helps put together and maintain cash flow statements in an organized manner. One can easily track accounts payable, accounts receivable, budget figures, expense records with details such as who has paid, who has not paid, when they paid, what’s overdue, etc. Therefore, corruption in QuickBooks may lead to adverse and unexpected outcomes. There are several reasons that make files corrupt. In the majority of cases, the user itself is responsible for the cause. In case of corruption, there could be additional issues that you may encounter while working on the system. The problem could be severe if the application is connected to any other reporting program externally. In case the external reporting programs use automatic sync managers to connect to QuickBooks, it is probable that you encounter incorrect reporting in these programs. Another problem could be sync failure which can bring adverse effects on incorporated data contents. It is possible to repair corrupt QuickBooks file using built-in repair tools. However, it is advised to reduce the overall size of the QBW file before initiating any workaround procedures else the problem will recur. Let’s go through the procedure to repair data corruption in QuickBooks files. Before initiating the repairing of QuickBooks data, it is recommended replicating the file to avoid permanent loss of data. After the backup is created, follow the given instructions to proceed further with the repair process. Run QuickBooks’ Verify Data function. This confirms corruption and further recommends Rebuilt Data. Note: When running Verify Data function, make sure that the QuickBooks file is in the single-user mode. Run QuickBooks’ Rebuild Data function to pull apart all data existing within in the file and then rearrange it in correct order. Again, run QuickBooks Verify Data function and when it is completed, test the file by running reports that were displaying errors and check if they are fixed appropriately. To open Verify Data and Rebuild Data option, go to File menu, click on Utilities and then select appropriate function from then appeared options. If the error still exists, it is not only the incorrect order of data that is creating an issue, but the corrupt data. After the Verify Data and Rebuild Data functions are completed, the next step is to review the logs being created by QuickBooks for data verification. The logs will specify the items and transactions that creates problems in the application. Following this information, you can go back and delete or delete and replace the items that have turned corrupt. Navigate down the log to address each existing item until the verification process completes. When you are working with QuickBooks, it is important to track the QBW file volume to avoid the chances of corruption. The file size limitation depends on the version of QuickBooks application being installed on the device. For QuickBooks Premier or QuickBooks Pro, the file size must be 200 MB and for QuickBooks Enterprise, the data volume must not exceed 450 MB. If the file size exceeds its stipulated volume, you may use File Condense function to reduce the size of the file. What if QuickBooks Verify Data/ Rebuild Data Fails & Backup gets Corrupted? Sometimes, running native solutions does not help to repair corrupt QuickBooks file. In such cases, it becomes important to employ third-party tools to repair all data that is corrupt, damaged, or unreadable. Stellar Phoenix Recovery for QuickBooks® Software is a professional utility that repairs all the contents including Company, Vendors, Customers, and Employees. The tool supports multiple currencies and repairs paychecks, job details, transactions and payroll information without compromising data. If QBW files turn corrupt, you can repair maximum data from the backup files, but if the backup files turns inaccessible, the tool can also be used for repairing the data from backup files. You are now aware of the possible ways by which QuickBooks files can be repaired, i.e. using built-in utilities: Verify Data function and Rebuild Data function and as well as the third-party tool. You also now know their advantages and disadvantages. Therefore, you can easily choose one that meets your requirement and guarantees 100% repair of QuickBooks corrupt QBW files. From the comparison drawn, the latter is found to be more suitable for successful repair as it does not involve any chance for data loss. This is because it is automated and reduces the chance of manual errors. Moreover, it provides a number of beneficial features that makes the repair process easy and quick. If you feel QuickBooks is not your cup of tea, feel free to try out any of these alternative accounting software solutions. What Accounting Software Do Startups Use?